In a speech in the European Parliament, Nigel Farage, leader of the UK Independence Party (UKIP) attacks the idea of creating the United States of Europe: “The whole European project is based on a falsehood… and it’s a dangerous one.. because if you try to impose a new flag, a new anthem, a new president, a new army, a new police force; without first seeking the consent of the people you are creating the very nationalisms and resentment that the project was supposed to snuff out.”. We agree. When thinking about the USA it is easy to fall for the idea that it is the wealthiest country in the world and that it would be difficult for people to hunger there. Reality is different. As the article published by Zerohedge illustrates, 21% of the USA population can’t afford food. 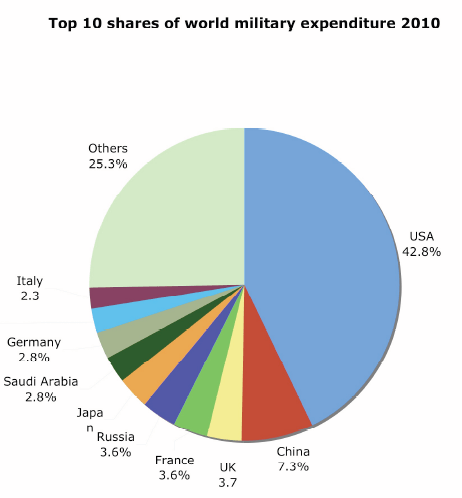 In contrast, the USA accounts for 42% of the world’s military spending. Guns, but not much butter.